Occupation: Co-Founder of Glean, an innovative food company working with farmers to help reduce waste and create healthy, clean label products from fruits and vegetables. Our company mission is Gathering Goodness: we work to revive produce & people for purpose – one fruit & vegetable at a time by finding a profitable home for farmers’ crops and donating pound for pound to fight hunger. Fun fact: our first product ever created was sweet potato flour! Favorite Sweet Potato Dish : Simple and easy: roasted cubes with a little ghee + spices. Sometimes when I am feeling a little more ambitious, I love creamy Sweet Potato Thai Soup! 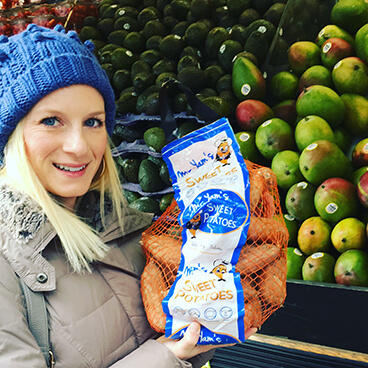 Why I became a Sweet Feet member: As someone who has been in the sweet potato industry for almost a decade, I have a deep passion and respect for our state vegetable. There is such a rich legacy and story around such a simple vegetable that many are unaware of. Our growers work diligently to plant, cultivate and harvest one of the greatest superfoods in the world – a vegetable that sustains so many and offers so much. Sweet potatoes are the most versatile and delicious vegetable around and are the perfect fuel for runners. I’m thrilled to have an opportunity to represent our state vegetable through fitness! Favorite Race: My first ever 5k when I was in my early 20’s. I literally used the Couch to 5k app because I was that out of shape! It was such a huge sense of accomplishment and was my first step to becoming a ‘runner’. What got me running: I’m admittingly not the best runner or even very competitive. Running for me has been therapeutic and an outlet that allows me to calm my soul and refocus on what matters. As a new & first time mom, I am looking forward to getting back into running as a space for me to have alone time and lead a healthier life- physically, mentally & spiritually. I also am excited to raise our children to understand the importance of health, fitness and nutrition as vital aspects of life. A little about me: Growing up in Eastern NC, I was raised by a home-economic teacher and in a family that believes food and agriculture cultivate a sense of community. I have always felt most at home in the kitchen and enjoying a meal around the table with those I love. Working in agriculture has given me a sense of humility, respect and pride for all involved. I enjoy creativity, product development, learning from others and feel the most alive when I’m brainstorming with others. My husband, Bradley, and 4 month old son, Anderson are the joys of my life.